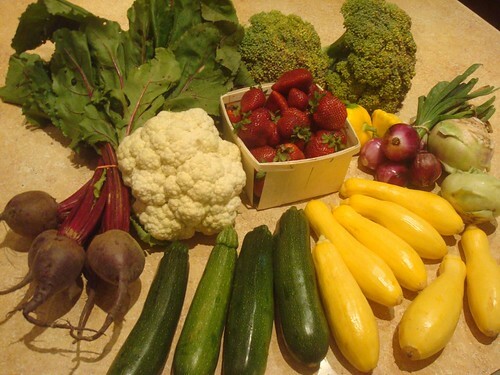 Beautiful beets, broccoli, cauliflower, summer squash, zucchini, onions, and a few adorable patty pan squash. This is a week full of veggies begging to be grilled, sauteed, roasted and devoured. Last night we roasted the beets (vegetable candy, absolutely delicious) and sauteed their greens with some onions and garlic. It was fascinating how variable the flavor of the greens was--from a touch bitter to a touch sweet. Tonight we sauteed/steamed some kohlrabi, summer squash, zucchini, onion, and garlic. The veggies were served over a bed of jasmine rice and topped with slices of lemon pepper chicken. YUM. Tomorrow, for Memorial Day, I think we are going to grill up spears of sweet potatoes (already on hand), summer squash, and zucchini. I have no idea what we will have with them--steaks maybe--but it doesn't really matter, the vegetables will be the stars. We are planning to make up some stir fry kits with all that lovely broccoli and cauliflower. We'll probably throw the remaining Chinese Cabbage in there as well as some kohlrabi. Some of zucchini will go into zucchini bread (hopefully with some canned pumpkin I have sitting in the fridge). The strawberries have already been cleaned and frozen in preparation for jam. They smelled absolutely divine, so I have no doubt the jam will be heavenly! I have veggie envy. Also, you've made me hungry for stir-fry. grilled sweet taters? please let us know about that one! Gentlevoice--The grilled sweet tater probably would have worked a lot better if we had simply grilled them in their skins. Instead we peeled and sliced them and wrapped them in foil. Excellent flavor, totally mushy texture.